In our web shop we have all kinds of hand tackers, hand pliers, cable tackers, hammer tackers and fasteners that belong to these tools. With us you get the lowest prices; always, not only with special offers. 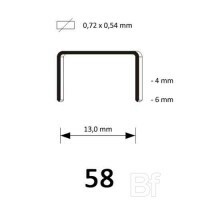 Staple type 58 has a crown size of 13,0 mm and is available in the following lengths: 4 mm - 5..
Saple type 43/8 suitable for plier 1/43 from Rapid. 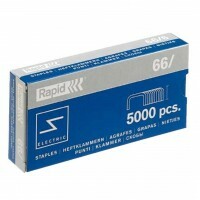 Qty: 10.000 pcs ..
Saple type 66/8 suitable for electric staplers 100E, 105E and 106E from Rapid. 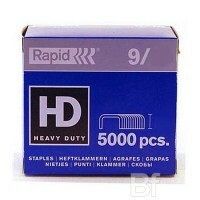 Qty: 5.000 pcs .. 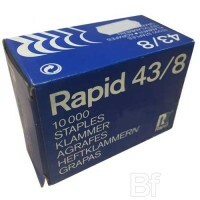 Rapid 9/14 staples for several types of staplers.Suitable upto 110 pages (80g/qm). Qty: 5.000 pcs..